Out of the can, this Red Racer White Ale is a very light, and slightly cloudy, golden colour. A very small head is gone in no time - not even a bubble, and zero lacing. In the smell is coriander and wheat, which are light. Brighter / stronger is the orange peel and dried apricot. The taste, similar to the smell, has the orange peel and apricot up front. The coriander is stronger, but still light. The body is light, with a nice, crisp (but not sharp) light-medium amount of carbonation. The finish is somewhat dry. 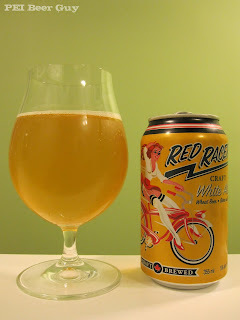 Overall, a very nice white ale - would be A-1 in the summer! The Central City Brewing Company continues to prove that top beer can come in cans.